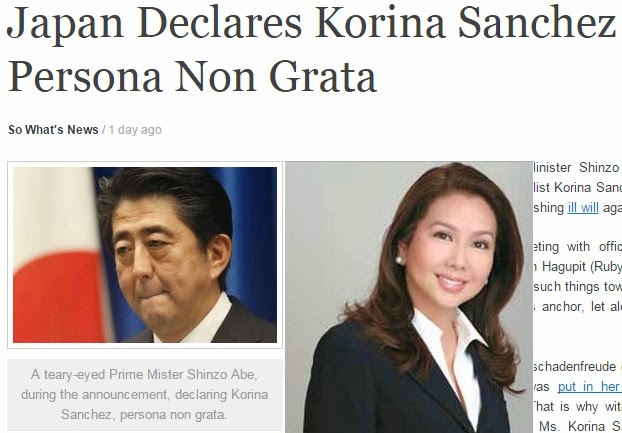 Korina Sanchez’s controversial remarks made on December 3 newscast of ABS-CBN’s TV Patrol apparently gained ire from Japan’s Prime Minister Shinzo Abe, the later declaring Sanchez persona non grata in their country, a report spreading on the internet claimed. It could be recalled that on the said newscast, the three hosts were deliberating about Typhoon Ruby (internationally named Habagat). Sanchez commented that Japan should bear all of the said typhoon since they are more capable. De Castro, her co-anchor and former vice-president of the Philippines, contradicted her but she insisted. This caused negative feedback from viewers, and netizens expressing their disgust over the internet. Most expressed their concern that we should not think ill of our neighboring country especially Japan which is also known to be an ally. Others pointed out that Sanchez’, whose husband Mar Roxas is purportedly aiming for presidency, should give up hopes to be a first lady since she could not even enact international diplomacy. The same report claimed that former Vice President Noli De Castro was declared persona non grata as well since he also remarked that he hoped half of Hagupit would devastate Japan. It could be recalled that this was not the first time Korina Sanchez had made a controversial remark on air that sparked rage from netizens. Just last year, she remarked negatively on CNN news anchor Anderson Cooper regarding the latter’s report in Typhoon Yolanda in Tacloban. She commented on her radio show that the CNN news journalist did not know what he was talking about when he reported that there was no government presence in Tacloban, the hardest hit by Yolanda. Cooper retaliated on Sanchez’s absence on the said scene. The report of Sanchez and De Castro being persona non grata was apparently a hoax from a satiric website Sowhatsnews but it does not stop the news from spreading virally online.